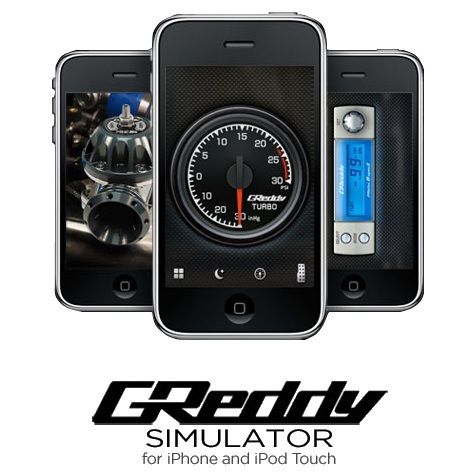 GReddy – 370Z Gets Boosted Finally! 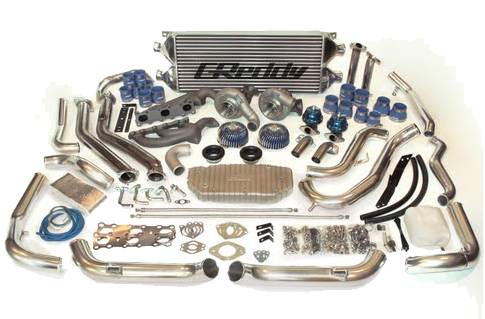 Introducing the latest addition to GReddy’s line of “Tuner Turbo Kits” the 370Z Twin-Turbo system boasts an impressive 175 rear wheel horsepower increase at a mere 6.4psi of boost. Tuner Turbo Kits come standard with high quality components: twin TD06SH-20G turbocharger, heavy duty cast turbo manifolds, Type T external wastegates, Airinx intake system, x-large Type-29 R-Spec intercooler, smooth flowing aluminum piping, and a large capacity cast aluminum oil pan. Paired with the optional tuning kit utilizing e-Manage Ultimate, plug-n-play harness, fuel system upgrade, and true dual 70mm Turbo Ti-C exhaust system, it is a fearsome street machine harnessing (535hp) 452whp and 344lb-ft of torque. 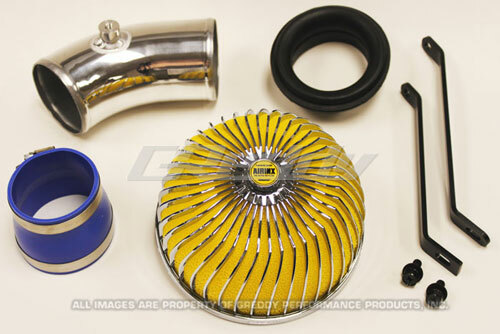 With additional engine work and tuning, this tuner kit has the potential of making 850 plus horsepower just as we were able to achieve on the GReddy Twin Turbo 350Z HR. 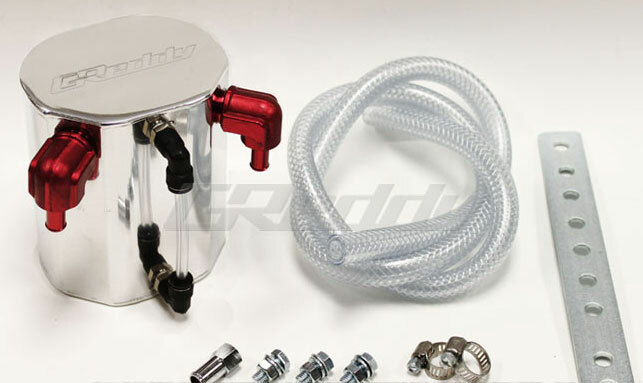 GReddy has released a new oil catch tank which will superceed all other GReddy oil catch tanks. The unit has a 600cc capacity, making it half the size of previous versions, and is an oval shape. 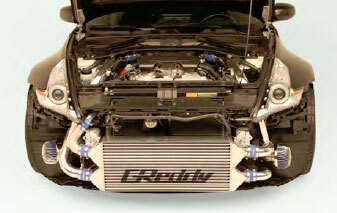 GReddy has released three new products for the Evo 10, an aluminum intercooler piping kit, suction pipe, and airinx intake. 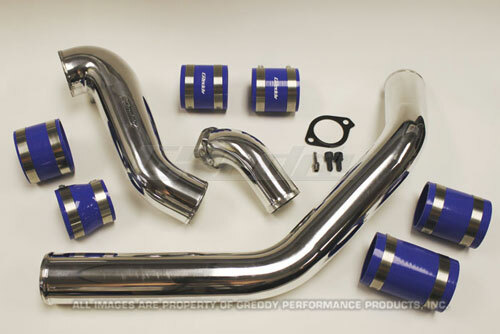 Introducing the latest addition to GReddy’s line of “Tuner Turbo Kits,” the 370Z Twin‐Turbo system boasts an impressive 175 horsepower increase at a mere 6.4psi of boost. 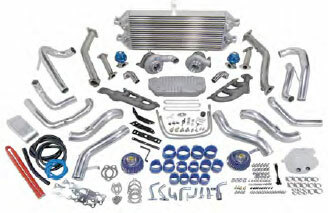 Tuner Turbo Kits come standard with high quality components: twin TD06SH‐20G turbocharger, heavy duty cast turbo manifolds, Type T external wastegates, Airinx intake system, x‐large Type‐29 R‐Spec intercooler, smooth flowing aluminum piping, and a large capacity cast aluminum oil pan. Paired with the optional tuning kit utilizing e‐Manage Ultimate, plug‐n‐play harness, fuel system upgrade, and true dual 70mm Turbo Ti‐C exhaust system, it is a fearsome street machine harnessing 452 wheel horsepower and 344lb‐ft of torque. 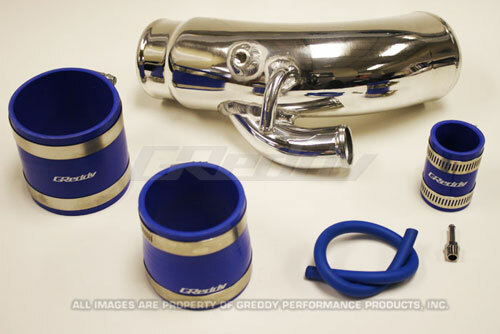 With additional engine work and tuning, this tuner kit has the potential of making 850 plus horsepower just as GReddy was able to achieve on their Twin Turbo 350Z HR. These will be available at the end of March, call now if you would like to reserve kits, stock will be limited. Those beautifully manicured fingernails of yours taking a beating while swapping that motor? 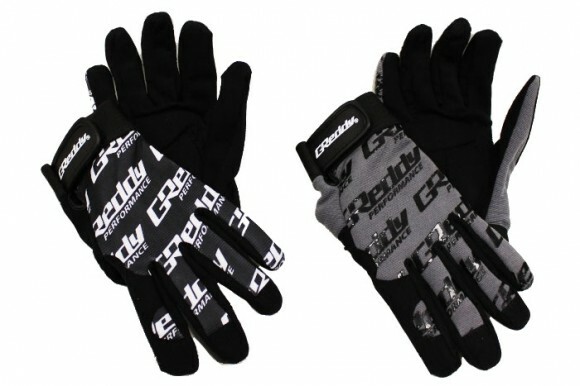 Then it’s time for you to invest in a set of new and improved GReddy Mechanic Gloves. With a new design and choice of two different colors, GReddy Mechanic Gloves feature a flexible feel, full fingered design and a padded palm for a more consistent feel.